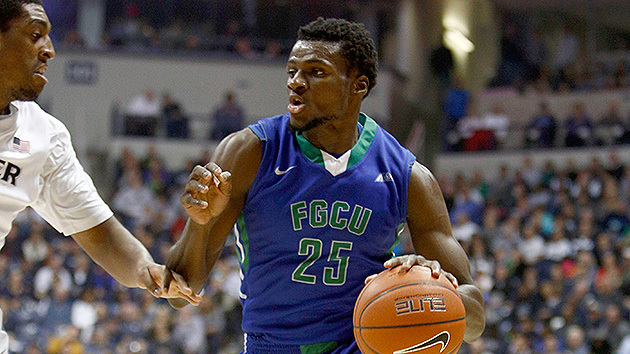 Everything you need to know about the Florida Gulf Coast Eagles as they begin the NCAA tournament. Impact player: Marc-Eddy Norelia, junior, forward. 17.2 ppg, 9.2 rpg. Case For: They’re back! The darlings of the 2013 NCAA tournament have returned to March Madness for the first time since their Sweet 16 run as a No. 15 seed, having won the Atlantic Sun on freshman Zach Johnson’s block in the closing seconds of overtime. But while those Eagles blew past slow-paced high seeds with their up-and-down offense in 2013, coach Joe Dooley, who took over after Andy Enfield left for USC, has installed a more deliberate offensive attack, which ranks 240th nationally in average length of possession. As fun as Dunk City was, the slower attack could bode well for success this time around, as shrinking the game through longer and thus fewer possessions has often been a recipe for underdog success. In the 6'8" Marc-Eddy Norelia and 6'9", 250-pound Antravious Simmons, the Eagles have a front line with decent size that should be able to hold its own. Both forwards (as well as 6'9" junior Demetris Morant) excel on scoring off offensive rebounds, on which the team as a whole ranks in the 86th percentile nationally according to Synergy Sports. And with a relatively low turnover percentage, the Eagles will not give away many opportunities. On defense, Florida Gulf Coast ranked first within the A-Sun in two-point defense and defensive rebounding during league play, while holding opponents to 31.0% three-point shooting over the course of the season. Case Against: Before winning three games in a row to secure the A-Sun’s auto-bid, the Eagles were not exactly hot. They were only 8–6 in the conference, placing them in a three-way tie for second place but also only one game away from sixth, and lost four in a row in late January and early February. In their only two tastes of NCAA tournament-quality competition, they lost by 20 at Florida (on Nov. 27) and by 10 at Texas A&M (on Dec. 2). This is in part because on a national scale, the Eagles do few things especially well. They are unlikely to make up for a talent disparity with sharp shooting—they make a mediocre 34.6% of their threes and attempt them at the third-lowest rate in the country—and are very poor from the free-throw line, making just 64.5%. They also force few turnovers, ranking 287th nationally in defensive turnover rate, per kenpom.com. For FGCU to play Cinderella again, it will likely take an unusual shooting performance and Herculean efforts from Norelia and Christian Terrell, its best but streaky three-point threat.